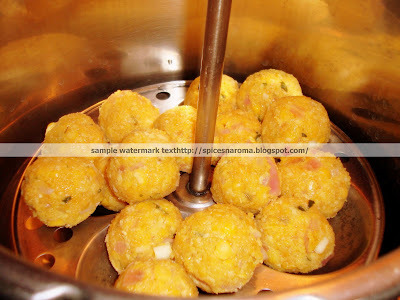 This is a very traditional dish from Tamil Nadu. This dish is rich in proteins. My mom used to make this quite often but now with the time constraint, we hardly cook this. I come from a large family with lots of cousins.This was always made in a huge quantity when the whole lot of us were around.Lentil dumplings have to be steam cooked before adding it to the tamarind-coconut sauce. 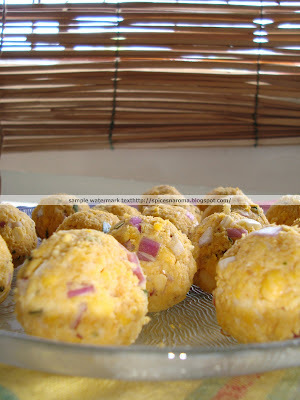 The simple spicy steamed lentil balls have a heavenly taste. We love it so much so that every time one of us will run to the kitchen and nick few balls to the terrace and gobble them before anyone can find it. We really enjoy irritating our grandmom during its cooking and she would chase us away till the entrance of the house. The people in the neighborhood would tease that her voice is heard even at the other end of the village. This dish always reminds me of my good old childhood days and is very close to my heart. 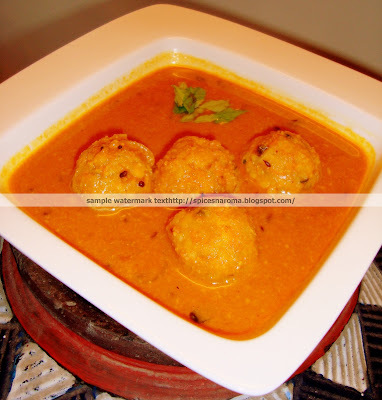 It is called as “Paruppu Urundai Kozhambhu” where the steam cooked lentil balls are added into the hot tamarind-coconut gravy and are allowed to cook in it. 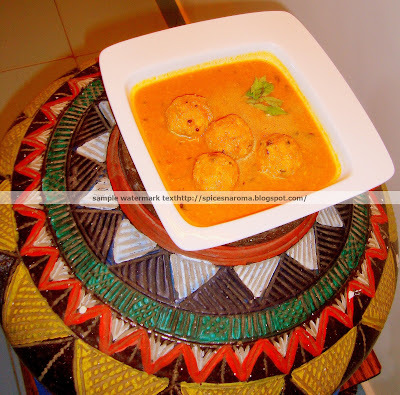 The lentil balls cook perfectly in the hot bubbling gravy within few minutes. The gravy taste great cos the juices gives it a deep aroma and flavour.Paruppu (in Tamil language) means lentil; Urundai (in Tamil language) means ball and Kuzhambhu (yet another tamil word) means gravy. This is a very special dish in my house and we crave for it often. This dish was passed on from my great grandmum to my grandmum then to my mom n now to ME. Soak the dhals in water for 3 hrs. Drain the water completely and grind them into a thick paste. Add the onions, garlic, coconut, chilli powder, turmeric powder, coriander powder, ginger, curry leaves, coriander leaves, salt. Mix them thoroughly and roll them into small balls. Steam cook them and keep aside. Grind the grated coconut and fennel seeds into a fine paste and keep aside. Heat oil in a kadai. Add the vadagam and cook for a min. Now add the onions and saute them for 2-3min. Add the tamarind extract and coconut paste. Add the turmeric powder, chilli powder and coriander powder. Simmer the flame. Cook till the raw smell disappears. Add the curry leaves and bring the gravy to a boil. Gently add the steam cooked lentil balls in a single layer . Cook on a low flame with the lid on for about 5-10 min. Give it a gentle stir every 2 min and serve warm with hot rice. It tastes great with dosa/idly/appam too!